Steven (Chicagoland, United States) on 19 September 2014 in Architecture and Portfolio. The Nathan G. Moore House, also known as the Moore-Dugal Residence, is a house designed by Frank Lloyd Wright. The house was built one block south of Wright's home and studio in Oak Park, Illinois. It was originally completed in 1895 in the Tudor Revival style at the request of client Nathan Moore. Wright obliged his client's wishes, but long after disliked the house for its adherence to historical styles. A 1922 fire gave Wright the opportunity to redesign the house. The structure was completely rebuilt above the first floor in a manner in keeping with Wright's other works of the late 1910's and early 1920's. While the new design stayed evocative of Tudor architecture, the house was heavily ornamented by details of Sullivanesque, Mayan, and other exotic origins. Wright’s second scheme remains largely intact today and the house continues to be a private residence despite a brief period as a tour home. 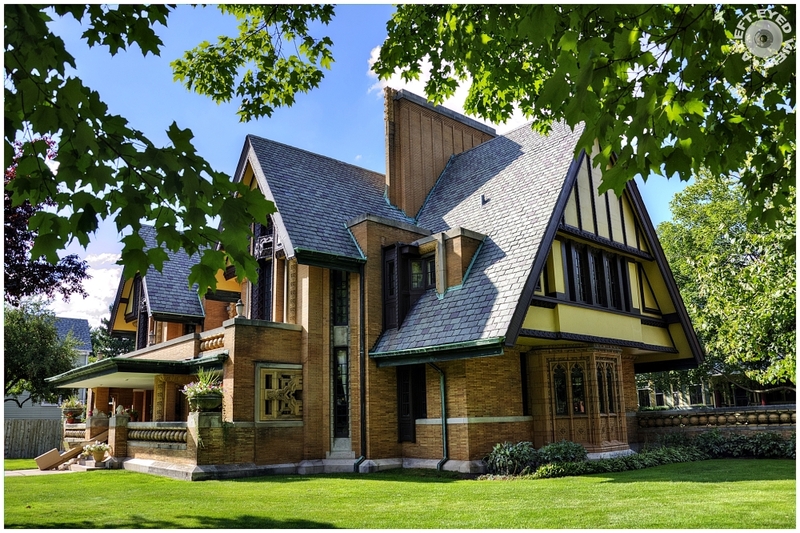 "Completed in 1895, this is Frank Lloyd Wright's first independent commission in Oak Park after Wright left the offices of Adler and Sullivan in 1893. On December 23, 1922, a spectacular fire destroyed the third and fourth floors of the home. Wright immediately returned to Oak Park in 1923 to redesign and rebuild the home for a second time." I am now exceedingly envious of this location - what a joy it is ! What a handsome house. Your processing is perfect. un angle superbe pour cette magnifique demeure. A fine shot of this spectacular home. I like how unique the style seems. Nice shot. an impressive mix of eclectic elements, of which a satisfying whole emerges! once again, i like how you used nature as a frame ! Quelle résidence avec la belle végétation superbe compo. It's hard to believe it didn't always look this way. It's perfect! Your photo definitely does it justice. Another lovely home. Great series. I enjoy that you give us the information on each of these beautiful homes. such beautiful frame, colors, lighting, shadows & textures! Beautiful building nicely shot. Well framed with the tree leaves. This home is just stately ... Superb image beautifully framed !!! What a fabulous house! I love the architecture! It is just beautiful! I think this is my favorite so far! An unusual architecture, great find! Wonderful series. Lovely home is nicely captured in beautiful colors and nice POV. Now that is an interesting and unusual construction. The framing with the branches of this landmark building is wonderful. This must have tested FLW's inner strengths!